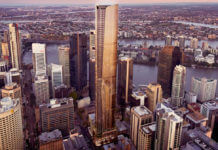 GBW Investments Pty Ltd has submitted a new DA for 2 Scott Street in Kangaroo Point for a 18 storey residential building. The building comprises of 17 apartments, each taking up one whole floor, ground floor pool and gym. Designed by Bureau Proberts, the tower’s design has been inspired by the local iconic natural elements of the Kangaroo Point Cliffs whilst also paying respect to the site’s heritage values and residential densities envisaged within the Kangaroo Point Peninsula Local Area Plan. The eastern elevation will be softened with the use of planting growing within the perforated screen reinforcing the embedded graphic of the cliffs as well as providing protection and intimacy for the residents. According to Bureau Proberts, the texture and substance are qualities that underpin the material expression of the project. The sense of honesty and rawness that is evident in the natural environment of Kangaroo Point is reﬂected in the qualities of material. Oﬀ form concrete, Stone and perforated metal with a ﬁne patina are materials that are honest and complete. They create a warm texture that completes the sense of connection and home to which the collective expression of the building aspires. 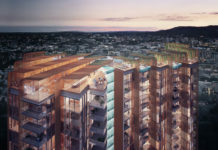 The No 2 Scott Street project provides a new direction for apartment living in Brisbane and in the particular development of the Kangaroo Point peninsula. The building works with first principals of designing for living in a subtropical environment by providing spaces that are shaded from direct sun and offer flexibility in the use of major living spaces. The resulting form draws form the natural features of the peninsula to offer a building form that contrasts the typical pattern of building expression and creates a striking addition to the peninsula built fabric. The building acknowledges its important role in this edge of the city by contributing to the city beyond its function as an apartment building. The DA number for this development is (A003897112). Wouldn’t really call that iconic, but nevertheless I think something really iconic should be built at Captain Burke Park, Brisbane Opera House maybe? It looks like a giant cage in the first three pictures and it fails to deliver from there. Really hope THIS is not built. So ugly from every angle. Please Brisbane, dont let them build this eyesore. The fourth pictur is just scary! I doubt those renders show what the screens will actually look like. Odds are you will see straight through them to the structure behind, whatever that looks like – hopefully not like the multicoloured facade facing the river! This might be a case of renders looking worse than the end result. I think GBW’s Silt project is one of the best residential developments of the last few years, so i’ll give them the benefit of the doubt on this one. Hope it comes out well.